Whyte To Wilder: You Are No Killer, You Are a Crackhead! 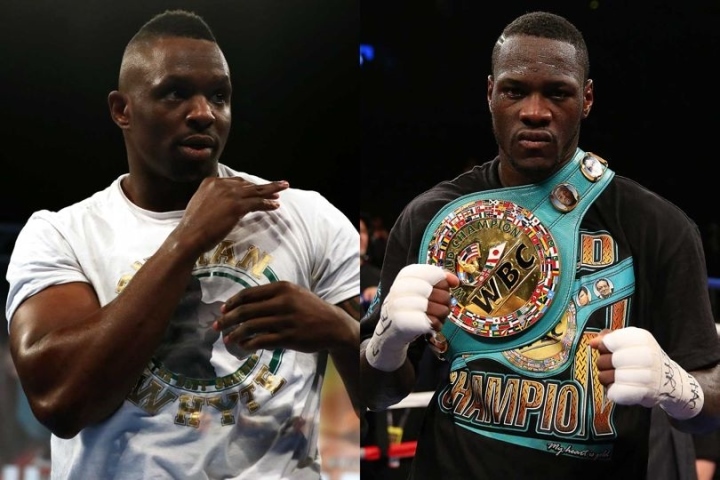 Top contender Dillian Whyte is very amused with some of the recent statements from WBC heavyweight champion Deontay Wilder. In several interviews, Wilder has discussed the possibility of killing someone in the ring. Wilder has knocked out almost every opponent that he ever faced, with 39 out of 41 fights ending inside the distance. Wilder is scheduled to face mandatory challenger Dominic Breazeale in a Showtime televised fight on May 18th at the Barclays Center in Brooklyn, New York. In a recent interview, Wilder said he would have "no remorse" if Breazeale passed away due to injuries from their upcoming fight. Whyte is currently pushing the WBC to make him the mandatory for the Wilder vs. Breazeale winner. The British boxer met with WBC President Mauricio Sulaiman a few weeks ago to discuss the terms of that potential order. Whyte expects Wilder to easily beat Breazeale inside the distance. “It’s an easy fight. Deontay Wilder will bash Dominic Breazeale up. Breazeale’s scared of Wilder. I watched the press conference, the face of Breazeale, he was shaking in his boots. Wilder again saying, ‘I can hear your heartbeat. I’m a killer, you’ve never been in front of a killer before’. What are you talking about? This is boxing, you’re not a killer. You’re not some hitman. It’s boxing. The guy is stupid," Whyte told IFL TV. “Wilder is a crackhead. Crackheads say crackhead-like things and do crackhead-like things. They’re desperate, they do desperate stuff, say desperate stuff and that’s why Wilder is a crackhead. He’s scared. He needs to say these things to himself to get his confidence up, he’s basically talking to himself. Top Headlines Photos: Srisaket Sor Rungvisai Grinds For War With Estrada Photos: Juan Francisco Estrada Puts in Work For Sor Rungvisai Photos: WBC Reveals The "Mayan Belt" For Canelo vs. Jacobs Photos: Rances Barthelemy Grinds For Robert Easter Title Clash Photos: Mohamed Mimoune Putting in Work For Viktor Postol Hunter: I Told Hearn I'm Ready For The Challenge of Joshua Mikey Garcia To Be Champion Emeritus, Campbell Goes For Title Garcia-Granados Main Event Peaks At 1.468 Million Viewers Team Luis Ortiz Reject Hearn's "Lowball Offer" To Face Joshua Oscar Rivas Was Close To Top Rank Deal When Whyte Offer Came Chauhan and Kumar Battled To a Draw in Mumbai, India Ruben Villa vs. Luis Alberto Lopez Tops ShoBox Card on May 10 Virgil Hunter Agrees That Amir Khan Still Has A lot Left in Tank Wilder-Breazeale - 'All Access' Series Starts on May 10, Showtime Golovkin Wants To Try Out 164 Pounds, Rolls 'To Be Comfortable' Roy Jones: Amir Khan Quit, He Should Be Honest and Apologize World Boxing Super Series Inks Pact With Sky Sports, Matchroom Darmani Rock Stays Busy With Hometown Return in Philly Barthelemy Still Plans To Go Back Up To 140 For a Title Shot Daniel Jacobs Unconcerned About Getting Fair Shake With Judges Crawford’s Trainer: F*** That; Not Fighting Brook In England BoxingScene Pound for Pound: April 2019 Update Chisora's Coach Does Not See Usyk as The Right Fight Enock Poulsen vs. Michal Syrowatka For Vacant EU Title in Play Amir Khan: Retiring at The Wrong Time Would Haunt Me Dana White: After Summer - I'm Making All of My Boxing Moves Froch Believes Time is Right For Dave Allen vs. David Price Rolls Admits on Golovkin: I've Got Mount Everest Ahead of Me! Victor Ortiz Raises Hand: Willing To Do Marcos Maidana Rematch Sergey Kovalev: Facing Artur Beterbiev is a Priority For Me Danny Roman Breaks Down His Unification With TJ Doheny Joe Noynay Stops Kosuke Saka, Wins WBO Regional Belt in Osaka Andy Ruiz Confirms He is in The Mix To Face Anthony Joshua Bob Arum is Pleased, Saw Improvements in Felix Verdejo Joshua: Jarrell Miller Does Not Deserve To Be in The Ring Estrada: I Feel Very Strong, Very Fast - I'll Take Sor Rungvisai's Belt Khan: People Will Still Want To See Me Face Thurman, Pacquiao 14 Day Weights: Canelo 165.4-Pounds, Jacobs 166.8 Terence Crawford: I Felt Amir Khan Took The Easy Way Out Rolls: This Isn't A Tune-Up For Golovkin; I'm Coming to Fight!